Maine. 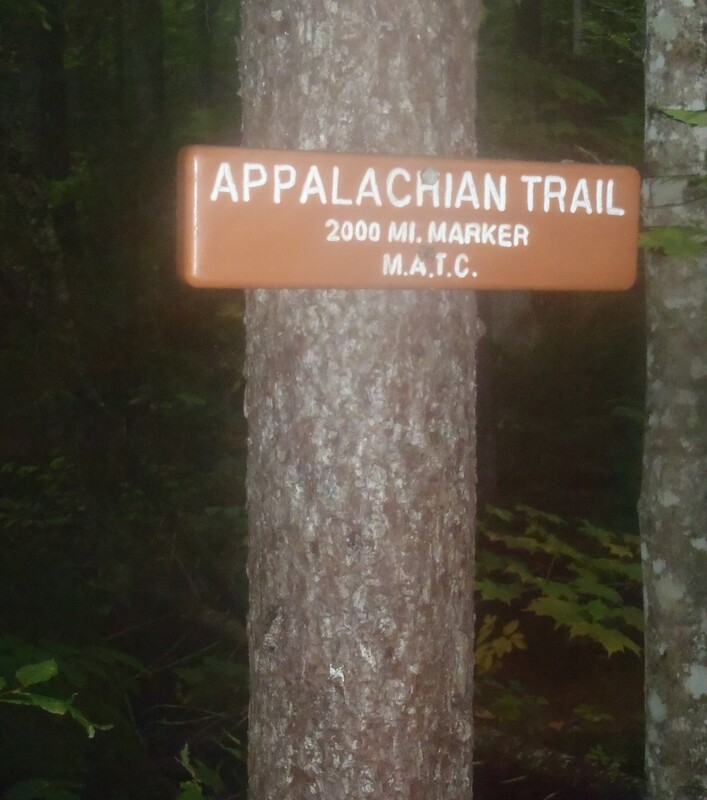 My home state, the final state on the northbound Appalachian Trail, the second longest state on the AT and arguably the most primitive and natural section of trail on the entire 2200 mile journey. 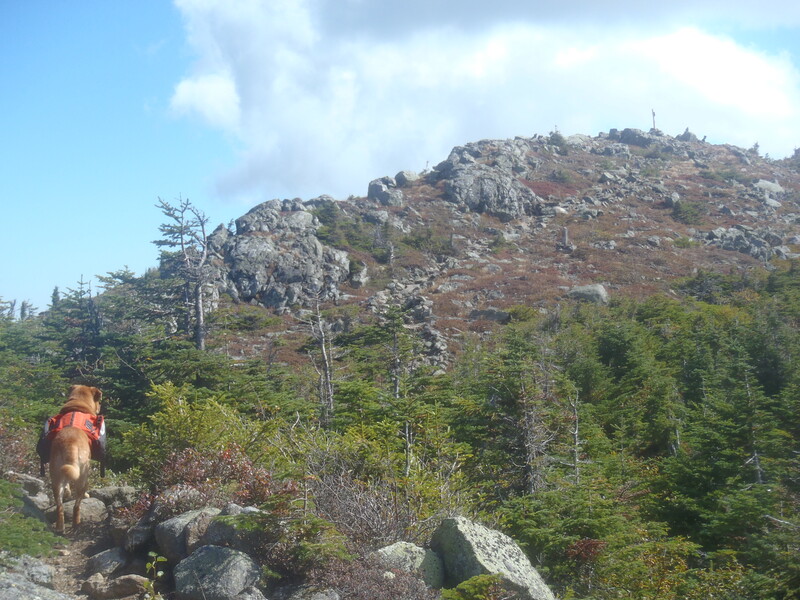 Within miles of crossing the New Hampshire border we came face to face with what we call the most difficult range of the AT, the Mahoosuc Mountains. 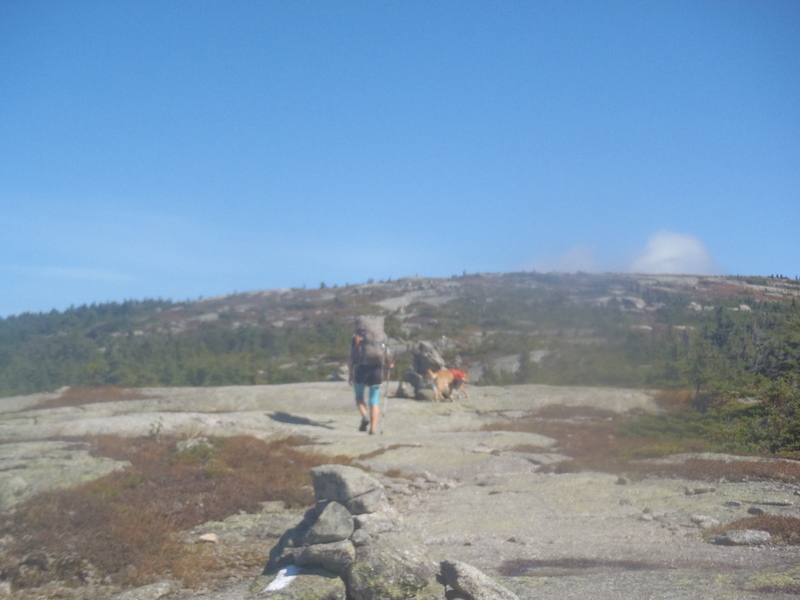 As we hiked the northern New England section of the AT our fellow hikers talked about two sections of the upcoming trail more than anything else: The White Mountains and the Mahoosuc Notch. The Mahoosuc Notch, or Mahoosuc Mile, is considered to be the hardest mile of the entire AT. With the Notch buried deep in the middle of the Mahoosuc Mountain range, the range itself gets very little attention and is consequently a very underestimated section of the trail. The Mahoosuc’s only take up about 75 miles of trail but it made us earn every one of those miles the hard way. As opposed to many of the other mountainous sections where we would make a big climb and then attempt to follow a ridge line, the Mahoosuc’s did not have a ridge line to follow. Making it through them and getting to Andover took five days of long and difficult hiking, with never-ending steep ascents and descents on rock ledges, boulder fields and a few stone steps if we were lucky! Spiff hiding behind a cairn from the 50mph+ winds! We made it to my hometown of Andover, Maine on a cold and rainy September, 11th which coincidentally was exactly the day we planned on getting there when we sketched out a timeline six months prior. We’d stopped in Andover and spent several zero days there throughout the course of our hike but Lindsay and I both decided that staying for more than an overnight this time would be too dangerous so we hit the trail north the next afternoon. Why would taking a zero in Andover be dangerous you ask? We’d never want to leave. Validating our concern: we actually returned to Andover two days after this visit because we “Trusted The Weatherman” and I will fully admit that I came my closest to quitting, even with just 200 miles left. The reason for this demotivation ended up being twofold. First, the weather sucked. Plain and simple, the weather sucked and neither of us wanted to go back out in the cold for three more weeks. 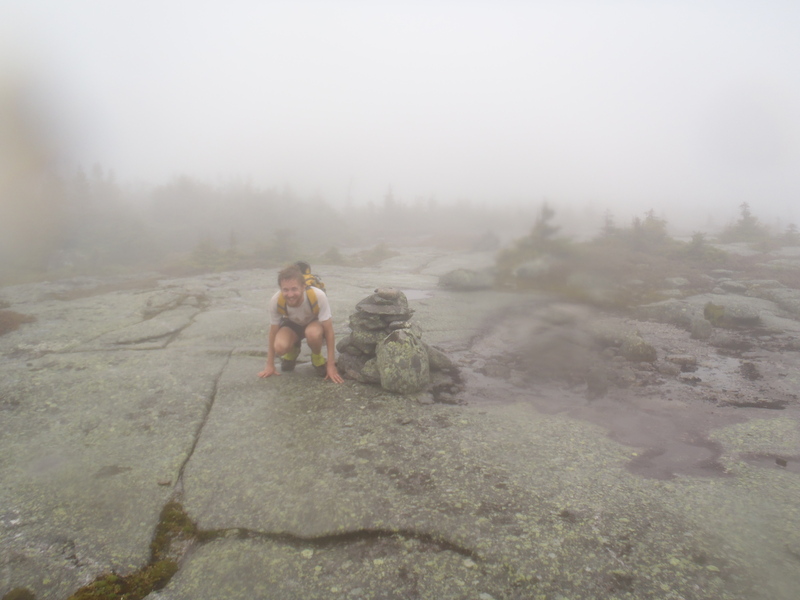 Daytime highs were in the 40’s, we flirted with frost every night and between the wind and unforcasted rain we had to battle the elements in addition to the rugged central Maine mountains. I was mentally exhausted with being cold and tired, which played perfectly to the second reason I was happy throwing in the towel; I’d already walked home. Right from the start in Georgia I proudly told strangers we met along that trail that I was “walking home”. Well, a bit to my own undoing I used this phrase for the whole summer and when I finally walked home I had accomplished my subconscious goal. Why did I need to walk the last 220 miles in the cold and rain? We had snow in the mountains at 4,000ft, which fortunately melted, and I can honestly say getting in the car to head back to the trail that morning was a mental struggle. Now, I’d like to say that I had a moment of self realization and found peace in myself and happily went forward to finish my adventure. Actually what really happened is I told Lindsay all of this, she quietly listened to my complaining, told me to stop being a little girl and that she was walking to Katahdin and I could join her or stay at the house and she didn’t care. Sometimes tough love is the best kind because I grabbed my bag and we headed north to tackle the next mountain! Besides the fact that it just would’ve been silly to stop with only 220 miles left and I have FAR too much pride to quit, I’m glad I kept going to experience all that Maine had to offer. The first day back we knocked out a crazy 23 miles, traversing both the Saddleback Range and the Sugarloaf Range. We both left Andover for the last time with the mindset that “we want to walk as far as we possibly can and just get this thing over with”. I’m glad that our mindset changed from “get it over with” after a couple days, just in time to hit the Bigelows. The Bigelow range might be my favorite set of mountains on the entire Appalachian Trail. 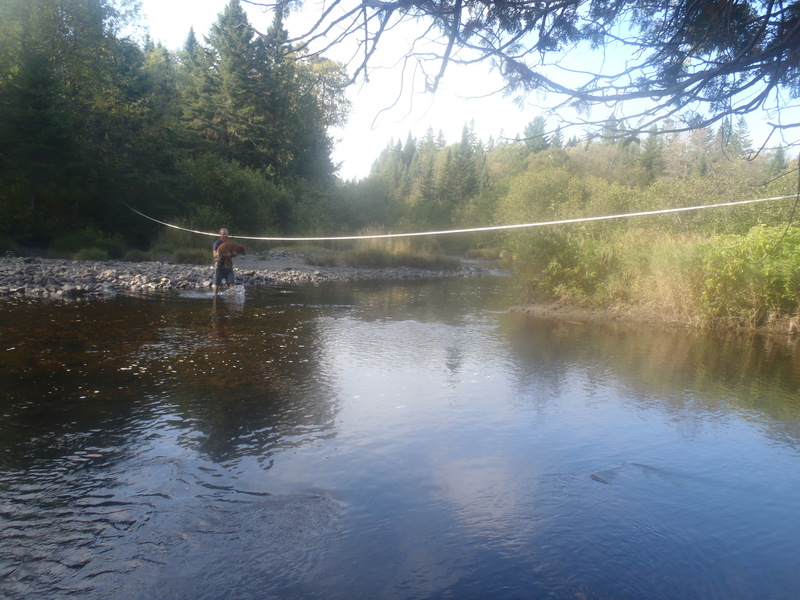 It’s funny how the 150 miles between the Mahoosuc Mile and the 100 Mile Wilderness seems to be a vacuum of terrain that no one talked about or really seemed to care that much about. People seem to only talk about the things that are going to be hard or supposedly miserable, and the middle section of Maine was neither. It was beautiful, however. Even though the Bigelows only span 25 miles of trail, they are 25 miles of trail I am looking forward to visiting again. High elevation ponds, gentle yet rewarding climbs, brief rock scrambling and alpine peaks above tree level made the Bigelows the ultimate “work vs. reward” section in my book. Maybe it was the weather, maybe it was the long days of hiking or maybe it was just bad luck. Either way, when we came down off Little Bigelow Mountain and walked into Caratunk, ME, Lindsay had a full blown head cold and I was flirting with one. We decided while taking the canoe across the Kennebec River that we needed to take an unplanned zero day to try and get healthy for our last two weeks on the trail. Fortunately we were able to do a work for stay, like we did months prior at the Black Bear Resort in Tennessee, and I could do the manual labor while Lindsay rested up and tried to fight her cold. In all honesty, stacking a few cords of wood in exchange for a place to stay isn’t a bad deal and despite a tight back the next day I’d gladly do it again as welcomed variety in physical activity. 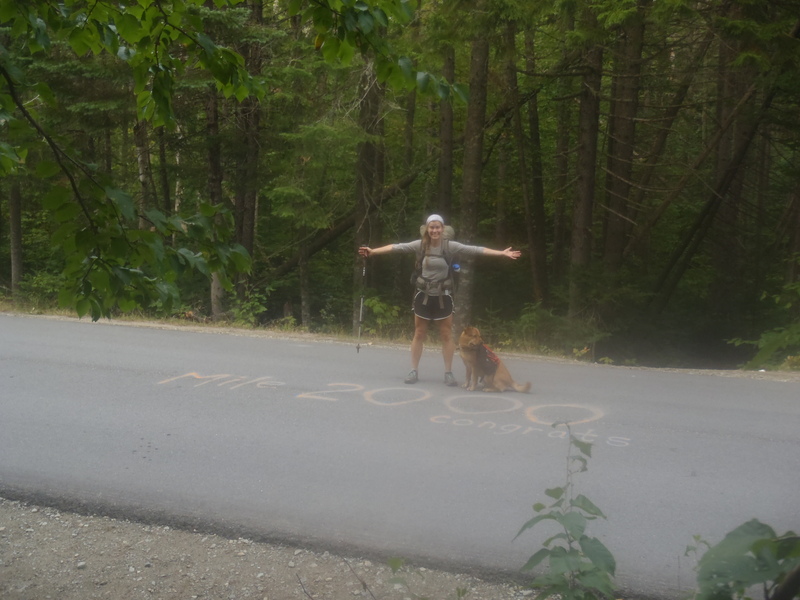 While staying the day and a half at the Sterling Inn in Caratunk we got the chance to talk to other hikers again. I know that sounds silly but we had been walking 10 to 12 hours a day and it seemed like we moved through a bubble of people never seeing the same person twice. It’s hard to have a meaningful conversation knowing that you’ll likely never see someone again, so it was nice to stay at the hostel and chat with people over breakfast. One of the common themes we found at this point in the hike is that the typical conversation starter changed from “what did you do before the trail” or “why are you out here hiking” to “what are you doing when the trail is over”. Two weeks out from the end of the journey most of the people around us were more concerned about what comes next rather than enjoying the moment. An anthropologist or psychologist could tell you more about what that means, but it’s an interesting observation. 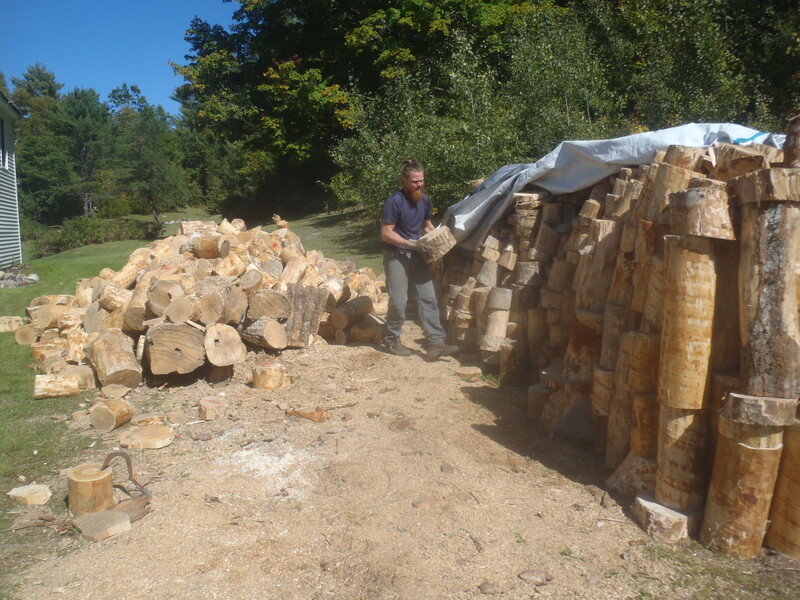 Clay stacking wood while Lindsay took photos… good thing SOMEONE was working for stay! 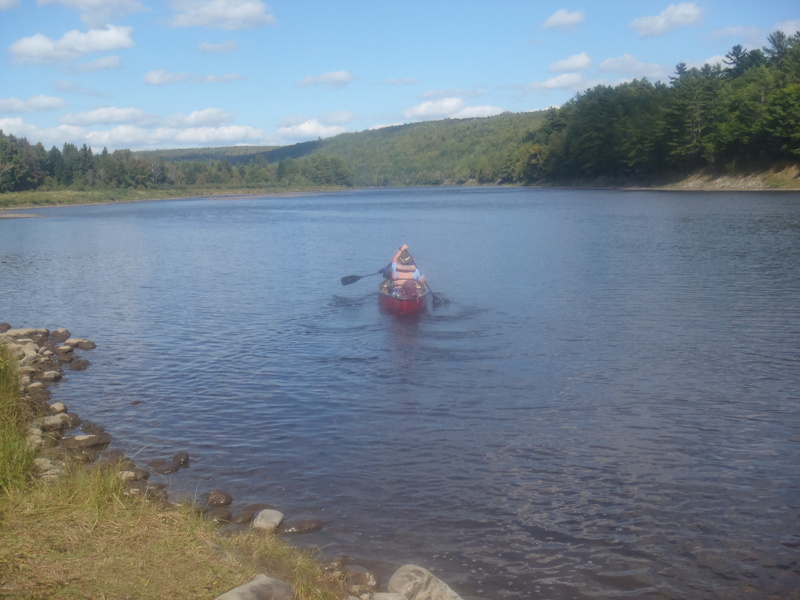 Paddling across the Kennebec River! Clay carrying the dog across the biggest river ford because he is a princess that doesn’t like to get his paws wet . By the time we made it to Monson and the southern boundary of the 100 Mile Wilderness we could smell the barn and knew our hike was soon to be over. 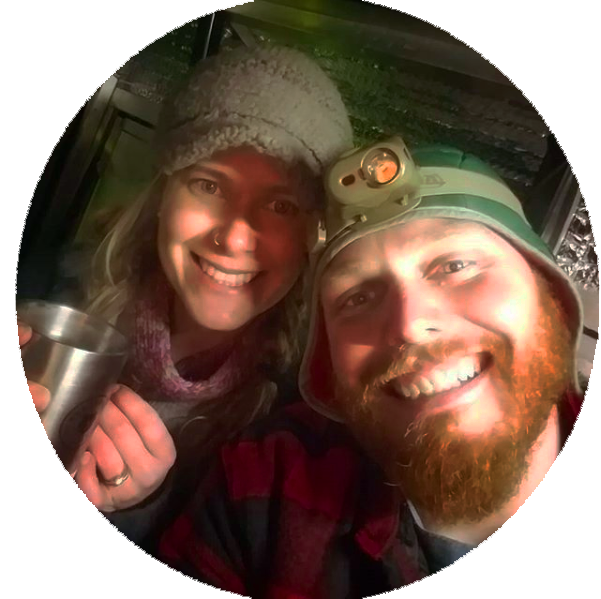 For the last two weeks we had been hiking on our own and in all honesty we missed our friends and even though we looked forward to summiting and finishing our thru hike it seemed like something was missing. We planned on sending Hunter home in Monson because of restrictions in Baxter State Park and it looked like we would be on our own for the last 115 miles of the trail. 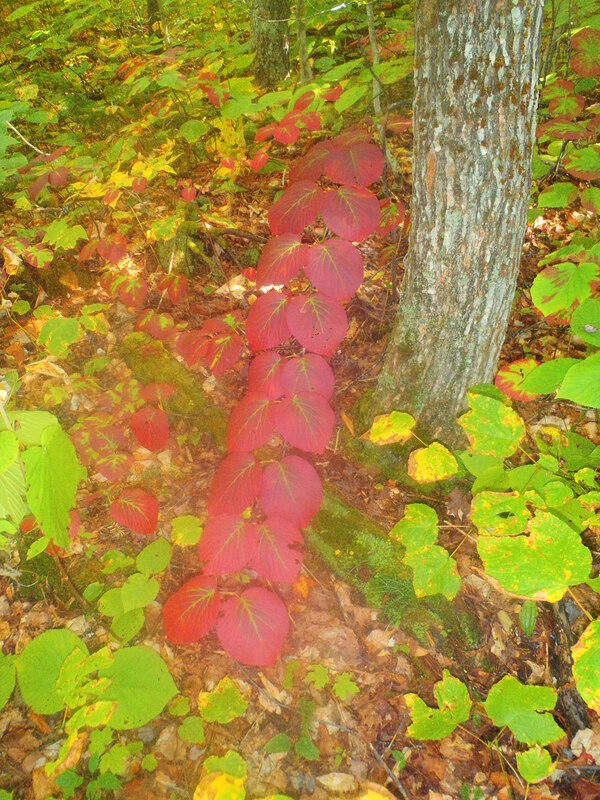 As things seem to go, if you just keep walking the trail takes care of you and that’s exactly what happened in Monson. Fern Gully, Sushine and Turtle had been trying to catch up to us for the past 200 miles, since we lost touch with them in Gorham, NH and low and behold they showed up to the same hostel we stayed at in Monson. It’s hard to relay in a 1,500 word essay how much it meant that those guys wanted to finish their hike with us and worked that hard day to make up the two days that separated us. Right when things seemed to be hitting a low spot for us it turned out that we would be able to celebrate our last week on the trail with the guys that we had made our journey as memorable as it is now. We spent our last night in a trail town not worrying about what was to come or looking at the guide book but enjoying a beer and a bbq on the patio of the hostel with long lost friends that we were very grateful to meet up with again. And with that, the only thing that stood between us and Mt Katahdin was hiking through the 100 Mile Wilderness. Sounds familiar. I would have died before I quit on one of Lindsay’s workouts. Enjoyed following your hike. What is next? What’s next? You’ll have to just have to keep following the blog to find out! Big picture though? Winter in Maine working seasonally at the local ski resort and I (Clay) am working primarily on a manuscript for a book that I’ve wanted to write. It’s a little bit bucket list and a story that I think needs telling, relating my military experiences and transitioning and healing through travel. Next spring we are going to India for a very close friend’s wedding and then will start working our way east to the states. Tentatively we want to hit Nepal for some backpacking, Turkey for some food and eastern Europe for some low cost European culture! Eventually we will be back to Maine and then I have to start working on getting Lindsay back to Alaska!